No one can be certain except newcomer Chasma bandmembers themselves how the band’s direction was chosen. Whether it was the inner calling, or the geographic location played a role, but Chasma plays a very definitive style of black metal. I often tend to think that you are always a part of your surroundings, and, in that regard, being from Pacific NorthWest makes it natural for Chasma to play atmospheric black metal, otherwise also known as Cascadian. Alternating between blasting and sad guitar touches, Daystar Angelwar evolves into a rolling cool march. All three compositions on Declarations of the Grand Artificer are 10 min or long, but the opener is full of potential and anticipation. It is edgy and does bring you to the brink of emotional breakdown, the somewhat familiar blasting and tremolo not yet pushing the all-too-familiar limits. The parts on the album do flow well one into another, but by the time Blue Jewel Destruction comes along, you can almost foresee when Chasma is going to blast, when they are going to play a sad acoustic line, and when it is time for an ominous conclusion. The funky stumble of Shadowbend transitioning into a steady melodic blast is cool, but more variety is needed to give this album range. Sadly, vocals on Declarations of the Grand Artificer don’t provide anything in the sense of diversity either. Hissing, slithering, snake-like, they are torn out from Aaron Schomaker inside, but they are very much monotone and constant throughout. A quick experiment with monk chanting a la Deathspell Omega in Daystar Angelwar is a welcome respite. 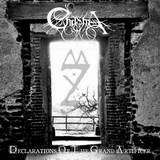 Xasthurian in its emotive approach, Chasma is not as melodic as Woods of Desolation and nowhere near as diverse on Declarations of the Grand Artificer as their fellow Cascadians Wolves in the Throne Room. If you are a fan of the style, however, where you can’t miss a single album in the genre, pick this up by all means. It isn’t terrible, just a bit one-note.